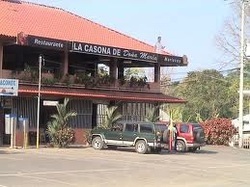 Dominical - Beach-side, in town. Bar and grill with views of the beach, surfers and people-watching. 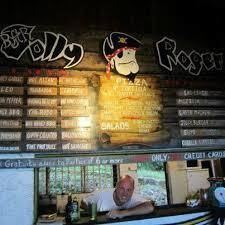 Good food and cold beer/drinks, reasonably priced, and friendly staff. If you go on Friday, Saturday or Sunday, you'll find beach-side vendors, craftsman and chair massage. 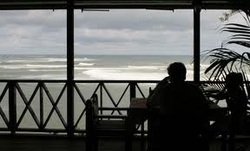 Dominical - 5km south of town. 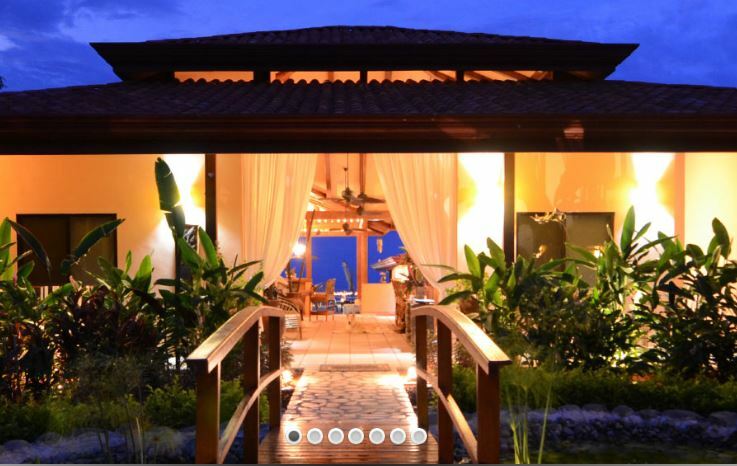 Fantastic ocean views on three sides, great for special occasions and sunsets. Dominical - South of town, across from Cuna del Angel, steep 2km, 3-5 minute drive up the road, but worth it. Great fun place for viewing the sunset, delicious wings, pizza and burgers, cold beer and Saturday night poker. Uvita - After the Bahia Ballena Gas Station, same side of the road. Great Chinese food, fresh ingredients! Friendly and attentive service, clean. Fair prices. 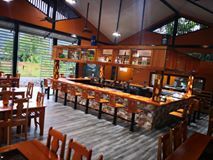 A must while visiting Uvita or passing through. Uvita - in town, across from Banco de Costa Rica. Free wi-fi, breakfast lunch and dinner. 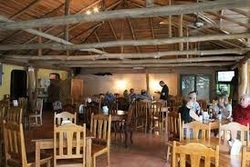 Reasonable prices, simple good food, tico and gringo menu. Ojochal - turn off for Ojochal, make your first left, located on the right at Plaza los Delfines. Wi-fi. Fabulous authentic French bakery with sausages and hams, coffee, pastries, serving breakfast and lunch. Ojochal - Turn off for Ojochal, make your first left, Citrus is on the right, tucked in the trees next to the river bank. Beautiful lighting, decor and atmosphere. Great for groups or romantic dinner for two. Diverse menu from Chef Marcella, good food and attentive staff. Call 2786 5175 for reservations. Ojochal - turn off the Costanera onto Perezoso Road, drive 500 meters up the road. 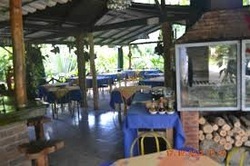 Located in El Castillo B & B. Lunch and dinner, fantastic place for drinks and poolside sunset. Stay for Mediterranean cuisine and lovely atmosphere. Call 2786 5543 for reservations. 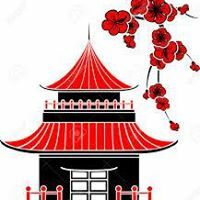 Want to add your favorite restaurant? Contact us, click here! 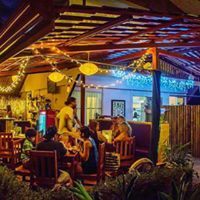 Dominical - The Restaurant at Villas Alturas has a one of a kind view of the tropical pacific coast overlooking the iconic Marino Ballena Whale’s Tail in Costa Rica. Enjoy a delicious breakfast, lunch or dinner, full bar with refreshing drinks and poolside service. Uvita - just north of Uvita. Great coffee, bagels, pastries, pizza and empanadas. Owned by Armando, a lovely man from Argentina. Very best margaritas on the Pacific coast, enchiladas, nachos, tacos... very fresh, great flavors. and made when ordered. great atmosphere and wait staff are exceptional. Uvita - Next to BM Supermercado (the 2nd one in town across from Banco Nacional). Free wi-fi. Serving breakfast, lunch and dinner and the coldest beer in town. Locals and Gringo hang-out, futball on TV at the bar. Tico cuisine, wings, fish fingers, burgers, friendly staff. 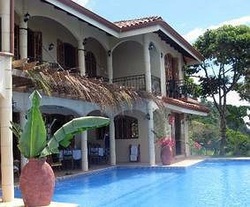 Uvita - Located at the turn off to Playa Chaman and the Villas del Sol neighborhood. Great mexican food, love the steak fajitas! Beautiful bar, great service, reasonable prices. Ojochal - next to the dirt road that runs through town, 5 minutes from the turn off. 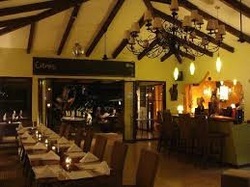 Exotica is a wonderful restaurant with great atmosphere and cuisine. Owners charming Lucy and her husband/chef, Robert serve an international cuisine. Fabulous place for special occasions. Call 2786-5050 on weekends or the busy season for reservations. Ojochal - Turn into Ojochal, go straight, turn right at the sign, 5-10 minute drive up the road. Mountain views. 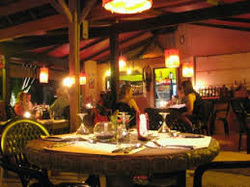 Small, casual, romantic and charming restaurant. 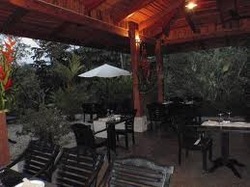 Great place for steak (not easy to find in Costa Rica), French and Argentinian cuisine. Wonderful hosts and owners, Oliver and his wife Celine. Call 2786 5558 for reservations.